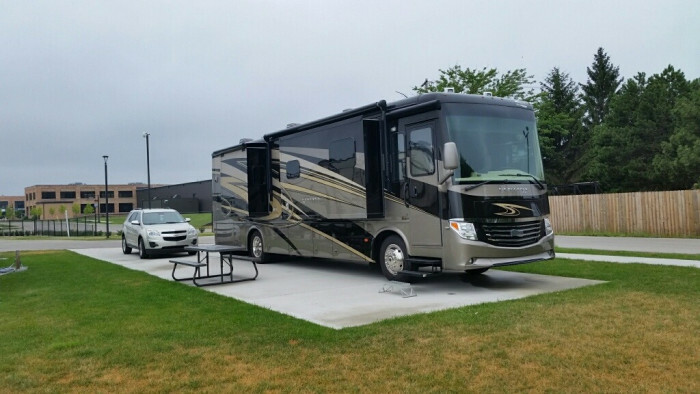 Ask fellow campers about "Eastpointe RV Resort" and nearby attractions. We had reservations for 3 days but ended up staying 12. 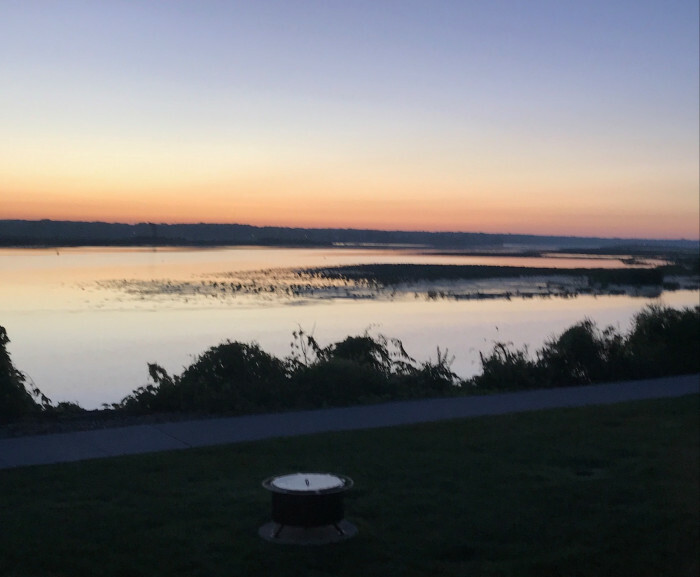 We paid $75 for 3 nights in site 118 on the water and felt it was worth it due to the fabulous view. Had to move because the front row was booked for the weekend and stayed in site 58 in the second row for $70 - didn't care for staying in the second row for that much money. Fall rates went into effect and we moved to site 93 on the water for $60. That was a bargain. No discounts given for Good Sam or anything else. The smell from the sewage plant next door was much more noticeable when we moved to that end of the park. Request a site away from that end when making reservations. I think the cheap seats in row 4 would be ok although you won't have a water view. You can still walk on the path along the water or go to the park next door. That is where the dog park is which is huge and has an area for both small and large dogs. There is also river access there. Plenty of grass in the RV park for dog walking too. Only grass between sites - no landscaping. Restrooms are nice but are basic, nothing fancy. It's kind of confusing when you arrive exactly where the entrance is. You just go straight into the park from Fulton Street and the sign is up kinda high on the building which we did not see at first. Wifi worked great - wish all parks had wifi like that. Good cable and strong Verizon signal. Close to everything to do in the area. Very nice place to enjoy the water views and swans swimming by and eagles flying overhead. We would stay again if in the area. 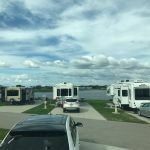 We camped at Eastpointe RV Resort in a Motorhome. Pizza place a block away on Fulton St was great - can't remember the name but it's in a grey 2 story house, can't miss it. We really enjoyed Odd Side Ales in Grand Haven. Pints and Quarts in Muskegon was another memorable meal. Our site, across from the water front sites, had decent water views. Yes the sites near the treatment plant did have odors one day out of six. We noticed it while out for our daily walk. No odor at our site. 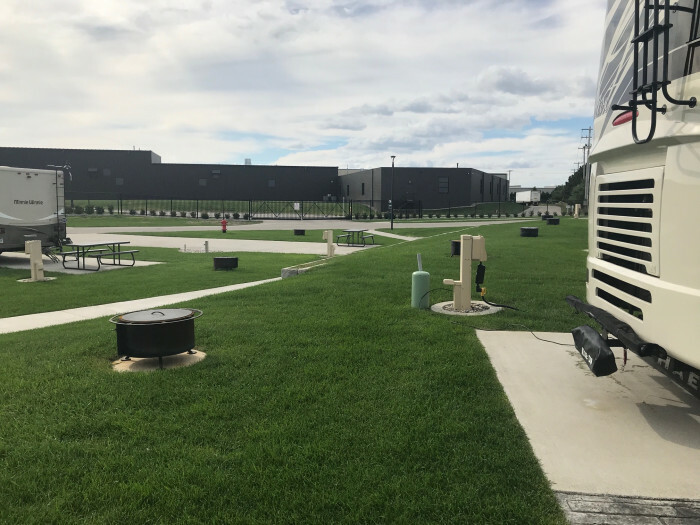 Overall these is a clean first class RV park. We will return. 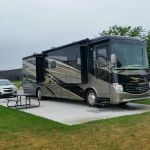 We camped at Eastpointe RV Resort in a Motorhome. Grand haven is great town to visit. Downtown is very active. The river front walk is great. Walk from the Marina (Downtown) out to the breakwater protecting the river entrance. Also has 2 lighthouses. At the breakwater is a State park with a very nice beach. We checked in fairly late. Owners were there for us and helped us with an issue with our tow vehicle. Sites are fairly close together but clean, easy to park and level. We were only there for one night but the facilities looked nice including pool, tennis court, and pavilion. Unfortunately, next to a sewer treatment plant so the evening walk was quite smelly...not something I would sit out in. Morning was fine. 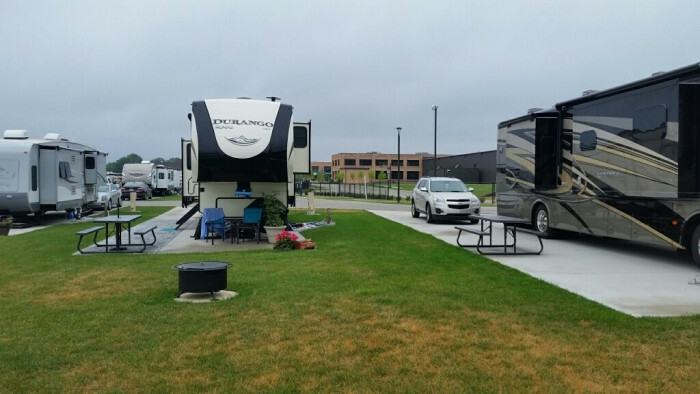 We camped at Eastpointe RV Resort in a Motorhome. If you're just stopping for one night, don't pay for the riverfront. Other interior sites were fine. The park is great. The concrete pads are large and level, interior roads are paved an smooth. A fire pit and picnic table are provided and wood is available for the camp store. Cable and Internet work wonderful but you have to have a digital TV. 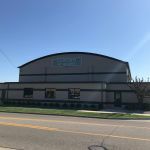 The only down side is its located right next door to a sewage treatment plant. We were in spot 121 which is the on the opposite end and only smelled it a couple times but I would have been really upset if I was at the other end, driving out the gate you really notice it. 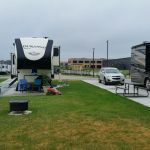 We camped at Eastpointe RV Resort in a Motorhome. Can't say enough good things about this park. Expensive but worth every penny. In a great part of Michigan with loads to do. Large well-spaced level sites. Great wi-if and cable tv. First class facilities including state of the art fitness facility and beautiful swimming pool. Spa-like showers in pristine condition. Owners and workers extremely helpful and friendly. Everybody raved about the place and we met lots of regulars. Spots were very limited and we were lucky to get in. We hope to get a spot again next summer. 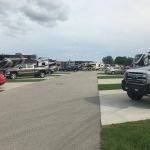 We camped at Eastpointe RV Resort in a Motorhome. There are some positives here: a nicely designed well-run park in the Grand River. Lots of grass. A nice pool and fitness room. Convenient to the shore beaches. 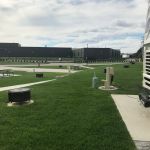 The negatives are: it is built next to a waste treatment facility and if the wind is blowing certain ways there is a distinct black tank odor -- not what one pays $75 a night to experience. The price is high in any regard but they had no trouble filling it up on the Memorial Day weekend. There is an insect problem. They had guys in gas masks out spraying something. It seemed to help. I didn't have a gas mask, however. 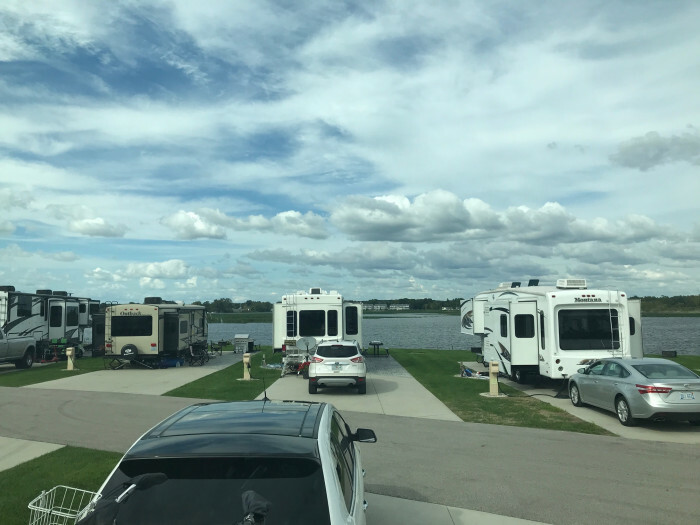 We camped at Eastpointe RV Resort in a Motorhome. Having stayed in over a 100 different parks in North America? This is number 2 on the continent. The reason not number 1 is Outdoor Resort in Cathedral City is number 1 :)) This park is worth every penny of the $70 we paid. 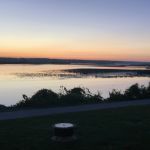 Easy to get to, easy to get in and out, very nice ambience on the water, pristine conditions as far as paved roads and sites, grass and cleanliness immaculate, very large sites. Just a great place to stay; we stayed for 5 nights and were not disappointed at all. Check in staff one of the most professional I've ever met as well. If you happen to get one of the waterfront sites, they trailer you in front ways; really cool idea as your patio is now facing the water!! We would definitely come back here again! 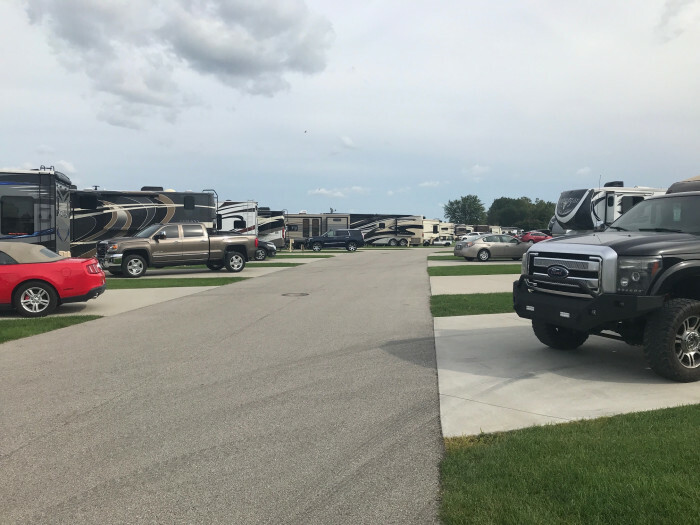 We camped at Eastpointe RV Resort in a Fifth Wheel. 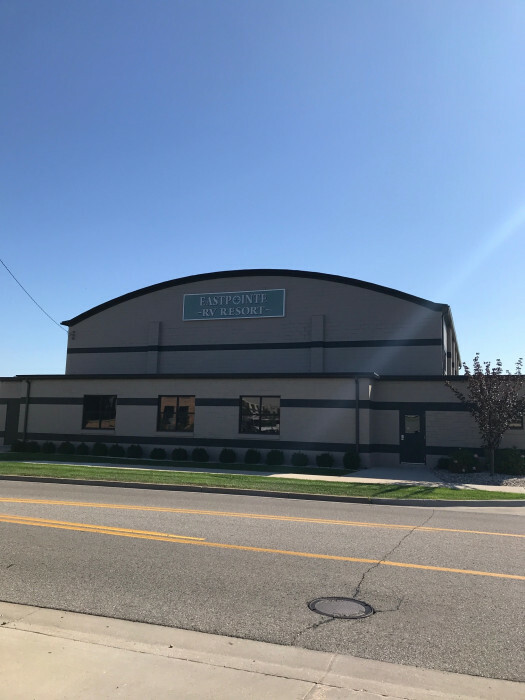 Are you affiliated with Eastpointe RV Resort ?